Rising investments in the industrial and commercial sectors along with government efforts to bolster the country's IT industry and digitization of the economy are expected to drive the demand various IT products such as for UPS in Jordan in the coming years. Commercial sector, that includes offices, educational institutes and the hospitality verticals, is a major consumer of uninterruptible power supply systems in Jordan, followed by the industrial sector. Mega development projects such as Marsa Zayed Redevelopment Project and North Shouneh Airport would help the market to grow at a modest rate during forecast period. 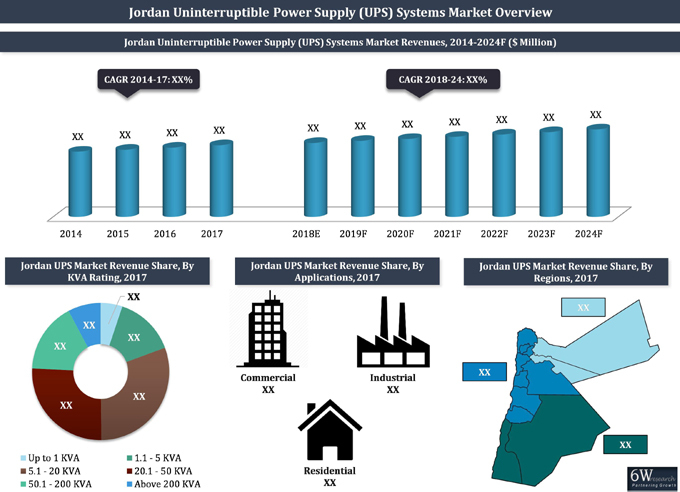 The report thoroughly covers the Jordan UPS systems market by KVA rating, applications and regions. The report provides an unbiased and detailed analysis of the on-going trends, opportunities/high growth areas, market drivers which would help the stakeholders to device and align their market strategies according to the current and future market dynamics.